If you are thinking about buying a violin in a violin shop, first ask yourself what kind of violin you need, and what price you are willing to pay. If you are just beginning, chances you will just need a budget student violin. However, even with these purchases there are things you need to look out for. There are thousands and thousands of Stradivarius copies. That Stradivarius violin in your attic/on that website is not a real one. Look for sellers who guarantee the quality of their product. Especially when buying online, ask if they have a money back or swap policy if the violin is not up to standard. You get what you pay for. If you are spending less than $100 on a violin, it will have a poor tone, and be harder to play than a more expensive violin. 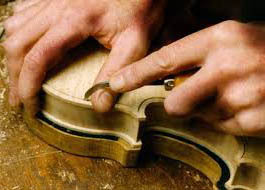 As a rule, avoid mass-produced violins like Ashtons, or anything made in China, Taiwan, Hong Kong etc. These tend to be unbalanced, have a horrible tone (meaning your playing will be extra scratchy) and badly put together, making the violin harder to play than usual. Ask for the height between the fingerboard and the strings - the higher this measurement, the harder the strings are to push down (and the harder it is to get a good sound.) 5-7mm or under is good, if it's more than a cm, don't buy it. Check the feedback from other buyers, or ask for recommendations from a local teacher or professional. Don't buy from a website you are not familiar with. When upgrading your violin/bow, there many more things to consider. Remember to always, always get a professional opinion, and never set your heart on a violin before you get it valued. It may look fine on the outside, but could be damaged on the inside. (Or not worth the amount it would cost to repair.) Other than this, have a look at these general tips to make upgrading easier. Always ask for valuation papers/get the seller to do a valuation for you. Make sure this is a professional valuation (ring the person/business who evaluated it to make sure they are qualified to value violins.) If there is any doubt in your mind the instrument is not the real deal, don't buy it. Always try before you buy. Preferably for a few days/weeks, as you will not get a good feel for the violin otherwise. Check to see how the violin compares to others (including your own) Is the bow heavier (bad) or lighter? (good.) Is the tone the same, or sweeter, or deeper? Is it easier to place the fingers on the fingerboard? Move positions? Play in high positions? Make sure you really think about every possible difference, and whether this difference suits you and your playing style. Violins never depreciate in value (if you do not break them, and don't get duped into buying more than a violin is worth. )It is OK to upgrade several times if you need to, as long as you can find a buyer for your current violin, you will never loose out. Check the quality of the strings. Strings are expensive to replace, ask what brand of stings the seller has on the violin. 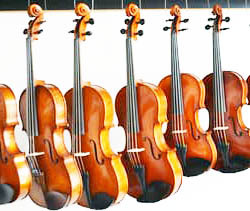 Visit our violin shop for old violins.French violins, Italian violins and violas.